The mysterious helmet leads the Micronauts to a fateful meeting with... themselves? In the void, a Time Traveler reflects on the Micronauts' journey to date: from Microspace, to the entropy cloud, to Earth, to the hidden city of the Kronus. Now the strange helmet recovered from the sentient Time Chamber guides them onward, leading the Heliopolis in pursuit of an unknown flying object. Weaving between confused human bystanders, the ship closes in on its target, which the crew are stunned to realize is a giant (by Microspace standards) robot! The behemoth, identified as a Microspace vessel, goes on the attack, and the Micronauts disembark to retaliate, leaving Microtron to man the Heliopolis. Almost immediately, the robot's crew do the same, revealing them to be none other than the Micronauts, each of them different in not-so-subtle ways! The doppelgangers immediately strike, sending Oz and Biotron plunging from the sky. Larissa attempts to help, but is blasted by her ringer – clad in armor akin to Baron Karza's – and must be herself rescued by Phen. Acroyear catches Biotron on the ground, but the large robot has been severely damaged, forcing Oz to get out. A child, Phen sees her artist mother. Flees her burning home with the Space Glider suit. Older, she is pursued by Reptos. Stands among their bodies, her glider wings ruined. Acroyear is sealed into his armor. Hoisted aloft by a victorious Karza. Microtron is constructed in a factory. Lies damaged alongside a wrecked Biotron. Biotron manhandles a scientist. Bludgeoned by a large robot. Larissa, a baby in an artificial womb. A baby in the arms of Baron Karza and Shazraella. Sees Karza's outstretched hand. Dons a helmet in his image. Oz stands among his fellow Pharoids, ready to probe the entropy cloud. Soars through space, the golden mask upon his face. As the duel lulls, the Heliopolis pulls in overhead: if they are to fly through the anomaly, it must be now. But the other Oz insists that the helmet is not telling them the whole truth, and that returning to Microspace would be a terrible mistake. The doppelganger no longer trusts the helmet, he explains, and removes it from his head... revealing nothing underneath but the roiling tendrils of the entropy cloud! With his duplicate promising explanations, Oz has Microtron land the ship, now convinced that the anomaly is not a path they should follow. Soon, both sets of Micronauts are gathered together for an overdue discussion. The alternate Oz explains that they only attacked because, knowing themselves, their counterparts were unlikely to listen otherwise, a point they begrudgingly accept. Oz's doppelganger explains that the Micronauts must, for now, abandon their attempts to return home – if they do so, they will fail in their quest... as the doppelgangers did. Biotron suddenly puts the pieces together: a time loop has occurred. The Micronauts went back to Microspace, through a hole punched by their future selves... a choice which led to them becoming those strange versions of themselves. But now the loop is broken, and the alternate Micronauts begin to fade away. As they disappear, the other Oz takes on the visage of a Time Traveler, and warns of the coming Earthwar. A war against foes know and unknown, which will decide the fates of two universes. A war in which human soldiers will fight against hordes of strange Acroyears. As the doppelgangers disappear, the helmet also mentions the Earthwar, but is not forthcoming with further details. The Micronauts return to their ship and set off once more... but unseen by them, the closing anomaly disgorges an army of the futuristic Acroyears! Characters in italic text appear only in flashbacks/flashforwards. "So... why did you attack us again? If you wanted to talk, why not just say so?" "We know you. You would not have simply... listened. 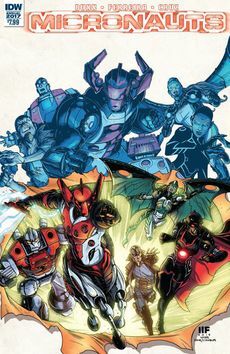 The opening five pages summarize the Micronauts story so far, through the first nine issues of the series plus Revolution. Phen's parents and the destruction of her home were previously described her profile in Revolution #5. Biotron's flashback manhandling a scientist is likely connected to his history as a Ministry of Science unit, as seen in issue #1. Issue #5 hinted that Larissa had history with the Ministry of Defense when attacking Acroyears showed interest in her. Oz's flashback shows the entropy cloud commune he participated in; we saw its bloody aftermath in an issue #3 flashback. The future Micronauts' ship is Karrio, a carry case accessory from the original Micronauts toyline. Larissa wears the helmet and jetpack of the Galactic Defender figure she is loosely based upon. One of future Biotron's hands has been replaced with a clamp akin to that of his original toy. In addition to his Karza/Daegon-inspired centaur body, the future Acroyear's helmet closely resembles the Marvel version of the character. This issue also includes Oz and Phenolo-Phi's profiles from Revolution #4 and Revolution #5, respectively, plus new ones in the same style for Acroyear and Microtron. Edited-down versions of the new profiles had previously appeared on the Humble Bundle Revolution trading cards. Regular cover: A Giant-Size X-Men homage by Marcelo Ferreira. Subscription cover: Acroyear looms over Oz, by Sam Loft. "The Hasbro Tribune" editorial page promoting January's Hasbro Universe Reconstruction titles, including G.I. Joe #2, M.A.S.K. #3, Lost Light #2, Optimus Prime #3, Till All Are One #7, Revolutionaries #2, Micronauts #9, this issue, ROM Annual 2017, and ROM #7. This page was last edited on 14 February 2019, at 12:52.